For 13 – 18 year olds as of January 1, 2019. This is a program designed for juniors who have little to no sailing experience. Sailors will be introduced to the fundamentals of sailing while aboard our 22 – 24 foot keelboats. They will be taught all the sailing basics to achieve their Sail Canada Basic Crew standard as well as their Pleasure Craft Operator’s Card. Youth getting ready to set sail! OBJECTIVE: This course is designed to teach the basic skills and knowledge required to crew on a small keelboat safely and efficiently, under sail or power, in moderate wind and sea conditions. A program for the junior who has their Sail Canada CANSail 3 or has already achieved their Sail Canada Basic Crew level. 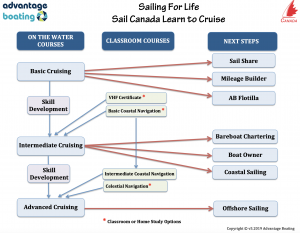 Intermediate juniors will work towards achieving their Sail Canada Basic Cruising Standard. PREREQUISITE: CANSail 3 or Basic (Junior) Crew. OBJECTIVE: This course is designed to teach the basic skills and knowledge required to helm/ skipper a sailboat of up to 30 feet in length, safely and efficiently under sail or power in moderate wind and sea conditions.